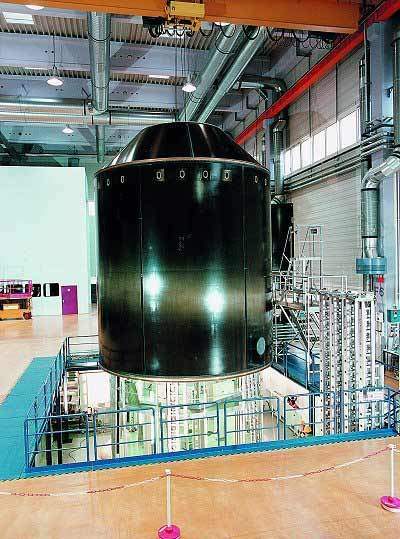 The main cryogenic stage carries most of the electrical and guidance systems. The Ariane 5 Final Assembly Building where the launcher receives its payload. The Vinci expander cycle engine with a thrust rating of 15.5t. The Speltra structure, which is positioned between the upper stage and the payload fairing. The Sylda 5 structure carries the secondary payload. Constructed with carbon-honeycomb sandwich panels. Ariane 5 is part of the European Space Agency’s (ESA) long-running Arianespace programme. According to Arianespace, Ariane 5 is the first new-generation launcher to reach the commercial market, arriving at least two years ahead of its closest competitors. The stakes are also high for the ESA, which has entrusted its most expensive and complex science satellite to Ariane 5. The successive versions of Ariane 5 include G, G+, GS, ECA and ES. ESA is an international organisation composed of 14 EU member states, which aims to promote space research and technology and their space applications. Arianespace is an industrial and commercial company and a world leader in the provision of commercial space transportation services. It markets and sells Ariane launch services, manages the production of the European launcher and provides launch operations from the Guiana Space Centre in French Guiana. 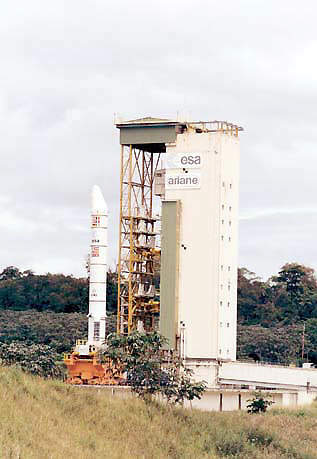 Arianespace acquired 20 Ariane 5’s for launch in 2001. The order covers two batches of ten, Ariane 5 launchers, out of a total of 50 heavy-lift launch vehicles to be acquired by the company under current production planning. Around 49 spacecraft were acquired and released into the orbit by Arianespace in 2009. The ESA member nations agreed to proceed with the Ariane 5’s development programme in 1987 and the launcher had been designed by early 1994. In the middle of 1995, Arianespace had ordered 14 of the launchers. The first launch in 1996 exploded spectacularly, destroying the load. The first successfully completed test flight came in 1998 and the first commercial flight was successfully completed in 1999. Six Ariane 5 launches were prepared for 2000. 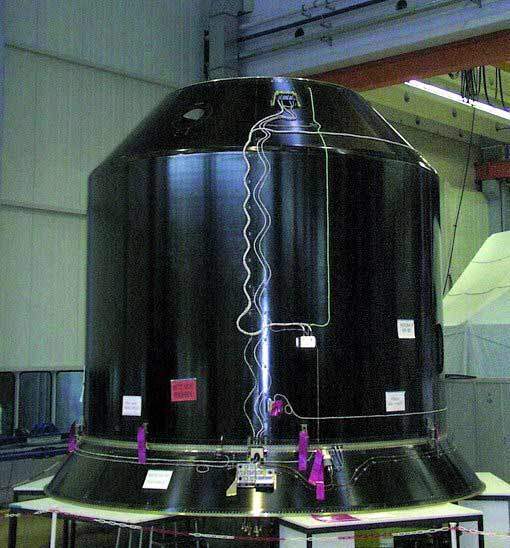 The vehicle consists of a main cryogenic core stage, two solid booster stages and an upper stage. The cryogenic stage is 30m high, and operates on non-toxic cryogenic propellant for just under 600s. The cryogenic stage has a propellant load of 132.27t of liquid oxygen and 25.84t of liquid hydrogen. Its Vulcain engine is ignited 7s before the launcher’s lift off, allowing full monitoring during start up and stabilisation of thrust. The solid boosters propel the rocket into the orbit. The final thrust is provided by the upper stage. Ariane 5 is the most powerful vehicle ever produced in Europe, with 1,200t of thrust. Just one of its two solid fuel boosters is more powerful than the whole of its predecessor, Ariane 4. Further technological development is essential to the Ariane’s continuing success. Initially, the launcher had a payload of 6,200kg. The eventual load is expected to be 12,000kg. The most important developments affect the upper stage of the rocket. Ariane 5 Versatile is an improved version of Ariane 5’s current upper stage. It was operated for the first time in March 2008, increasing the GTO payload lift capability to 7,300kg-8,000kg. It is used primarily for missions to low-Earth and medium-Earth orbits. Ariane 5 ESC-A is an upper stage craft, which enabled Ariane 5 to place loads of 10,000kg-10,500kg into geostationary orbits. The launch was completed on 11 December 2002 but turned out to be a failure. The Ariane 5 ESC-B will be powered by the new Vinci engine and will increase GTO payload performance to 11,000kg-12,000kg. The launch of ESC-B has not yet been completed and SNECMA is working on the development of the Vinci engine. The first test firing of the engine was successfully conducted on 27 May 2010. The engine is expected to be launched in 2016 or 2017. To accommodate its wide range of loads, the Ariane 5 launcher has adapters that are geared to different loads. The Speltra structure, which is positioned between the upper stage and the payload fairing, allows Ariane 5 to carry two primary payloads on a single flight. A ‘lower’ satellite is accommodated inside the Speltra, while the ‘upper’ payload is mounted atop Speltra and is protected by the payload fairing. The Sylda 5 structure is housed inside Ariane 5’s payload fairing, and allows the vehicle to carry two primary payloads on a single flight. During the flight, Ariane 5’s upper satellite is deployed first. The Sylda 5 is then cut at its base by a pyrotechnic charge, and the structure is separated by push-off springs. The lower passenger is then ready for its deployment, completing the mission. Sylda 5 is a cylindrical-conical structure manufactured from carbon-honeycomb sandwich panels, assembled by bonded joints, and bonded and riveted aluminium frames. The ASAP platform carries mini- or micro-satellites as secondary payloads. Nine Ariane 5s carried the automated transfer vehicle as part of the agreement made between the ESA and Arianespace in 2000. In September 2003, Ariane 5’s maiden triple-spacecraft payload was carried on flight 162. Other satellites carried by the Ariane 5 encompass the INSAT 3E telecommunications / video broadcast satellite of the Indian Space Research Organisation, Eutelsat e-BIRD broadband services platform and ESA’s SMART-1 lunar probe. The ESA’s Rosetta comet-intercept spacecraft was launched atop of Ariane 5 in 2004. Arianespace further signed a contract with ESA to launch and manufacture 30 Ariane 5 launchers including Ariane 5 ECA vehicles and Ariane 5 ES. 2005 Ariane 5 launches included the SPACEWAY 2 and TELKOM 2 satellites for American operator DIRECTV. A PT Telekomunikasi Indonesia Tbk for an Indonesian operator was also launched with two other satellites. The total payloads lifted by Ariane 5 in 2006 included ten primary satellites and one auxiliary passenger. 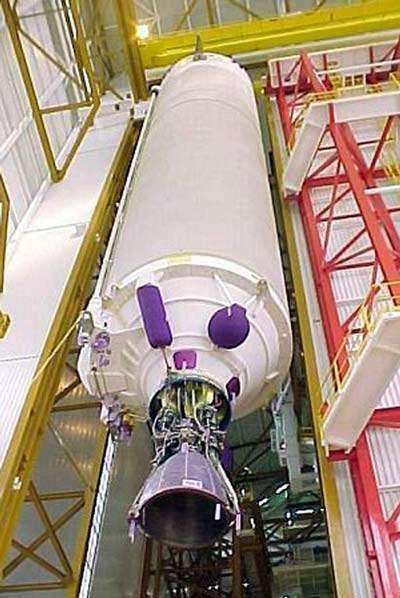 In addition to 30 Ariane 5s ordered in 2004, Arianespace produced 35 Ariane 5 launchers for Astrium in 2007. The Hughes Network Systems SPACEWAY 3 satellite was delivered into geostationary transfer orbit (GTO) with BSAT-3a in August 2007. At the end of 2008, Arianespace signed a service and solutions agreement with ViaSat for the ViaSat-1 satellite. In February 2009, Ariane 5 HOT BIRD 10, NSS-9 and two other Spirale payloads were launched. Ariane 5 ECA lifted the largest commercial satellite TerreStar-1 in July 2009. The launch of US-built telecommunication satellites JCSAT-12 and Optus D3 was undertaken by Ariane 5 in August 2009. Ariane 5 successfully completed its fifth mission by launching the Amazonas 2 satellite for Spain’s HISPASAT, and COMSATBw-1 for the German armed forces in October 2009. Two more satellites, the NSS-12 and THOR 6, were launched in the same year by Ariane 5 from Europe’s spaceport in French Guiana. On 18 December 2009, Ariane 5 launched the Helios 2B military observation satellite. The 2010 launches began in March with the ASTRA 3B telecommunications satellite for SES ASTRA and the German COMSATBw-2 secure military relay platform. Ariane 5 launched the ASTRA 3B and COMSATBw-2 communications satellites into geostationary transfer orbit in May 2010. In June 2010, Ariane 5 launched Arabsat’s Arabsat-5A communications satellite and Korea Aerospace Research Institute’s communication ocean and meteorological satellite (COMS) into orbit. The NILESAT 201 broadcast satellite and RASCOM-QAF1R communications satellite were launched into the orbit in August 2010. Two communication satellites, W3B and B-SAT-3b, were launched atop Ariane 5 in October 2010. In November 2010, Avanti Communications’ INTELSAT 17 and HYLAS 1 communication satellites were launched. Two communication satellites Hispasat 1E and Koreasat 6 were launched in December 2010. In February 2011, Ariane 5 launched an automated transfer vehicle named Johannes Kepler for the ESA. Ariane 5 launched the Yahsat Y1A and Intelsat New Dawn communications satellites in April 2011. Ariane 5 completed its 58th launch by orbiting Asia’s ST-2 and GSAT-8 communications satellites in May 2011. The ASTRA 1N nad BSAT-3c/JCSAT 11 satellites were planned to be launched by Ariane 5 on 1st July 2011. A problem detected in the control valve (EPC) has caused a delay in the launch. Arianespace is expected to announce a new launch date in the next few months. Arianespace is planning to launch the OHO-1 satellite into orbit in mid-2012. Ariane 5 can carry payloads weighing 10t and 20t into GTO and LEO respectively. The launch vehicle is highly accurate and provides dual launch for both GTO and GTO+. Earth-escape trajectories for interplanetary flights, servicing missions to the International Space Station and MEO and LEO constellation spacecraft are deployed with dispensers. Ariane 5 is further capable of providing highly efficient dual launches to most telecommunication satellites. TITAL is a leading company for titanium and aluminium alloy investment castings, located in Germany. Using the patented HERO Premium Casting® process, TITAL delivers lightweight, high-strength investment castings that can be supplied "ready-for-integration" and enable significant cost savings and many other benefits to the customer.